From the evening of the 19th of August to the following morning there was a torrential downpour when more than one month’s rain fell on the northern outskirts of Hiroshima city. Homes, cars and much, much more were washed away as mudslides poured down the hills and into the areas of Midori, Yamamoto and worst-hit Yagi in Asa-Minami Ku. For the past week, the local and national news headlines have been full of heartbreaking and tragic stories of the people lost and the families left behind waiting for the news that they dread but know will come. The scenes of the elderly man who lost his wife of 50 years breaking down into tears as he meets the Mayor of Hiroshima, Kazumi Matsui, and then the Prime Minister, Shinzo Abe, have been heart rendering. Just by coincidence, I decided to volunteer exactly one week after the rains and cycled to Asa-minami-ku from Hiroshima City centre where I live. I had looked up where the Asa Minami Ku volunteer centre but still managed to get lost forgetting just how far away it was. Just as I was asking the way at Midorii Elementary School a fellow cyclist rolls up and offered to show me the way. Taking short cuts that only a local would know, we got to the centre in about 10 minutes only to find out the registration centre had changed and was 20 minutes back the way I had just came. One of the people in charge told me, ‘You’ve come this far so we’re not going to tell you go back. Lock your bike up and go into room and we’ll put you in a team.’ Then my guide pipes up, ‘Well, I only came to show you the way so I’m off back to the school where I’m volunteering.’ I had no idea he had gone out of his way to show me where to go and felt distinctly humbled which set the tone for the rest of the day. Before we were put in teams everyone was asked to write their name on 2 post-its and on one large name sticker-the post-its were for the team leader to keep and for the centre to check. I was put in a team of ten and we were told to pick a leader and someone to be in charge of equipment. If you do go to volunteer, in the explanation session you will be asked if you have anyone has ever done disaster relief work before and if someone raises their hand, try to get in a group with some experienced people as they will be able to tell you exactly what you need to take from the centre. I was impressed but not entirely surprised at how well-organised and well-supplied the centre was. I had bought some work-gloves the night before but there were piles of gloves there for the volunteers as well as masks, bottles of water and even wellington boots to borrow. If you have big feet for Japan like me (29cm/UK 10/ US 11) you should really bring your own as the biggest ones I could find were 27cm. There were shovels, wheelbarrows, hoes, brooms and brushes that you could borrow. I would imagine that on the weekends there might not be enough to go around but on weekdays, if you cannot bring your own shovel then you can borrow one from the centre. After collecting all the tools, my team and another team were sent to a house in Yagi which had been directly hit by the river of mud that had flowed down the mountain. When we got there, I thought there was no way that we can shovel and shift all this mud in one day as it was 60 cm (2 feet deep) in places and probably even more under the floorboards. The old lady who owned the house said ‘Just do what you can, anything you do is more than welcome. What you don’t finish, I’ll ask the next group to do.’ We split into two groups-one inside and one outside the house and we set about the task of trying to do as much as we could. The weather was still changeable, raining one moment and sun shining the next and every time it rained, you could hear the fear in the old lady’s voice. ‘You’ll have to stop and go back down.’ If it does rain, all the work is stopped as nobody is going to take the risk of falling victim to another mudslide. The weather got better and even though this meant were dripping with sweat we spent the day filling ‘donou’-raffia like sandbags for putting the mud in. We must have used 300 hundred donou and still we didn’t finish the job. 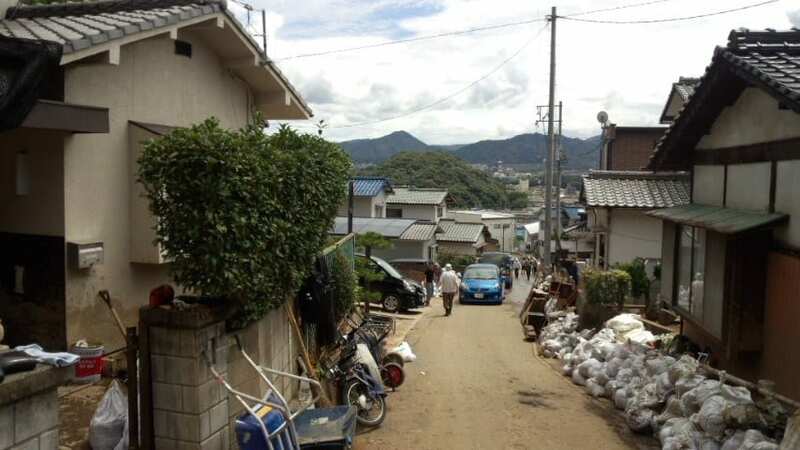 I was lucky in that I was in a team where there were people who had volunteered in the Tohoku area after the tsunami in 2011 and volunteers from Yamaguchi who had helped out after the rains in Iwakuni. They told us all to take breaks for drinks even when we had only just started, made sure that we all took turns shovelling, filling the sandbags, loading the sandbags and then moving them onto the roads and after lunch handed around salty sweets. At times I felt, ‘Why are we taking a break again? We can do more.’ but the experienced volunteers said, ‘This will take days and months, we will do as much as can today and leave it for the next group.’ This makes so much sense and there is a sense of acceptance and resignation that we are all in this for long run, we will do what we can and help each other. Even though the houses surrounding the one we were working were not so affected by the mudslides, they let us pile up the sandbags and the rest of the rubbish on their land. After cleaning the tools we set off back to the centre about 2:30 in the afternoon and yet again, the amount of planning and organization was apparent. Even though we had washed the tools we had used there was an area set up just for that, then a place for washing your hands and gargling. This might seem over the top to some people but even with a mask on all day there was dust and dirt all around my mouth and nose so take advantage of it. After this, there were drinks, snacks and freshly made ‘onigiri’ rice balls to give you some kind of pick me up after. I got changed and said thanks to the organisers and the rest of my team and cycled home. 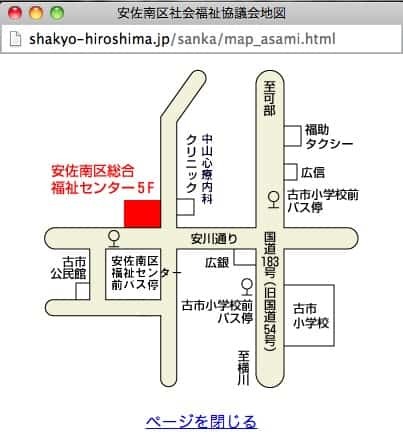 There are micro-buses to take people back to the Volunteer Centre in Asa Minami Ku (Map in Japanese below) so as long as you make your way there (public transport is best) you will be able to get home. I noticed my bike was covered with dust as I cycled home and that is something to remember-as the mud and dirt dries out the dust will get worse; gloves, boots and masks are essential now and I can see a time when goggles will become so too. When you are there it just seems like hard work but the human loss hit me again when I got home. I got an email from an ex-colleague now living in the UK but who was visiting her family who live in Yagi at the time of the mudslide. Fortunately, her parents’ home wasn’t damaged but her uncle’s house next door was. They now spend their days cleaning up and sleeping in the evacuation centre. This isn’t about them and us-this is us. Daniel James is a long-term resident of Hiroshima, head of department at Suzugamine women’s college, avid cyclist and family guy. PechaKucha Hiroshima: Art, Design, Kagura, Music, Sports, Community & more!